Thanksgiving is almost here. If your holiday is anything like mine, chances are you will end up playing a board game by the end of it. Nothing like a little friendly competition on the holidays. Some stick to Candyland for kiddo’s sake while others take on Cards Against Humanity for laughs. Here at Bookmans, it is no secret that we got mad love for tabletop games. That’s why I couldn’t help but compile a list that you absolutely must play this Thanksgiving. These games are sure to please and for the most art all ages so the whole family can play. I don’t know about you, but any time I can make more fake money or be more profitable than my family members I am going to enjoy the heck out of it. I am still holding the time I literally won at LIFE against my sister. She got saddled with 12 kids and no prospects. That’s why I absolutely love the surprisingly competitive Settlers of Catan. In Catan, each player has to build a settlement. They trade resources like wheat and ore. You add buildings and roads as your settlement grows. By the end of the game, whoever has the largest settlement with the most resources wins. The best part of the game is the trading. Sometimes you get stuck with only sheep. Then you have to somehow convince your opponents that they really need this sheep just so you can get your hands on some brick or wood. Settlers of Catan also comes with a million expansion packs, so the fun is endless. If you want to try something a little more old school, I highly recommend the board game classic. Basically a sophisticated version of BS, Balderdash consists of each player taking turns choosing a word from the “definition box.” The player then reads this word aloud. Each remaining player must write on a piece of paper either their guess at the definition of the word or a fictitious definition. This ficticious definition should be so good that it convinces the others that it is the correct one. The first player then reads each definition aloud. Everyone votes on which one is correct. points are assigned from there and players move across the board. The best part about this games is that, though there is definitely a limit on players in the directions, you can play with as many people as you want. I’ve personally played this game with like 5 people before and it was awesome. Okay, this one I have not played but the internet told me about it and I’m dying to try it! Another game where you get to play mogul. In Dinosaur Island, you build a park, re-engineer dinosaurs, and hire staff to build the most lucrative knock-off Jurassic Park you can. There are security mishaps and escaped dinos of course. But they make the game even more exciting. Plus, the overall design of the game is very circa the 1980s. You know you’re going to enjoy it’s totally rad esthetic. The only downside is the game is made for 1-4 players limiting how many people can play. Nevertheless, Dinosaur Island seems like great fun. Plus the kids would love playing this one too. 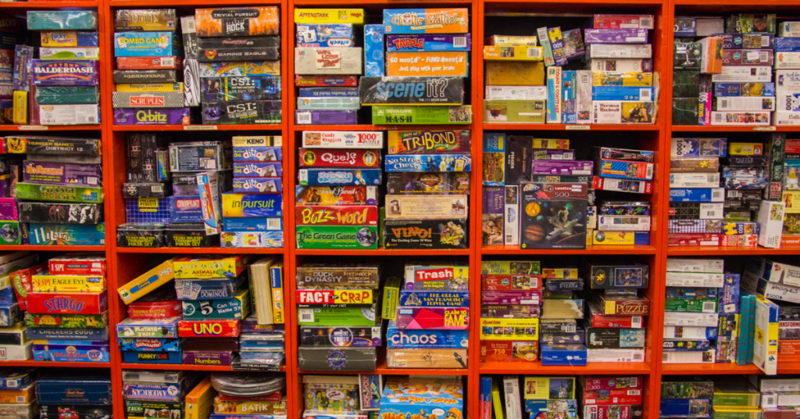 What are some of your favorite board games to play? Or do you have a fun after dinner tradition with your family on Thanksgiving? Tell us in the comments below! Bookmans is your store to explore. If you are interested in an item mentioned here give your local Bookmans a call and one of our staff members will be happy to check our shelves.